This event will be held during Brain Awareness Week at the John Radcliffe Hospital in Oxford. This event is aimed at any members of the public with an interest in Dementia. We will have talks on current Dementia research in the region as well as a number of information stands and interactive exhibits where you can find out more about services and support available in the area. To book your free place register here or call the ARUK administrator, Melanie on 01865 282358. You can also email aruk.administrator@dpag.ox.ac.uk. We will have a number of information stands from relevant organisations including ARUK, Alzheimer's Society Oxfordshire, Young Dementia, Dementia Oxfordshire, and Carers Oxfordshire. Speakers include: Marianne Talbot (Author of Keeping Mum: Caring for Someone with Dementia), Francesco Tamagnini (Reading University), Timothy Johanssen (Oxford Drug Discovery Institute), Jo Brooke (Oxford Brookes University), Ivan Koychev (Oxford University) and Nicky Lovett (Oxford University Hospitals). This event will be held during Brain Diaries 2017 at the John Radcliffe Hospital in Oxford. This event is aimed at any members of the public with an interest in Dementia. We will have talks on current Dementia research in the region as well as a number of information stands and interactive exhibits where you can find out more about services and support available in the area. or call the ARUK administrator, Melanie on 01865 282358. We will have a number of information stands from relevant organisations including ARUK, Alzheimer's Society Oxfordshire, Young Dementia, Dementia Oxfordshire, Carers Oxfordshire, and Creative Dementia. The talks will start at 10AM with a break from ~11-12 to visit the stands and get some refreshments. We will hear from Katy Stubbs (ARUK), Prof Richard Wade-Martins (ARUK Oxford Coordinator), Dr Francesca Nicholls (Dept. Psychiatry, Oxford University), Nahid Zokaei (Dept. Psychiatry, Oxford University), Dr Michele Veldsman (Clinical Neurosciences, Oxford University), Maria Parsons (Creative Dementia) and Elaine Biles (carer). We will finish with a dementia question time session. The session will be in Lecture Theatre 2, in the Academic Centre at the John Radcliffe hospital behind the main building opposite the M&S cafe. 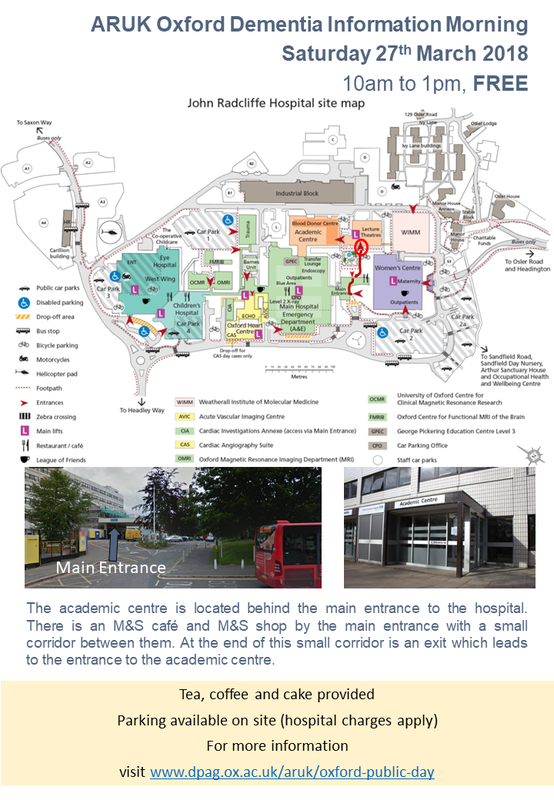 How to find the John Radcliffe Hospital. This year's Dementia Awareness Day was held at the John Radcliffe Hospital in Oxford on the morning of Saturday March 19th, to coincide with Brain Awareness Week. The Oxford ARUK Network Centre organised this event to discuss current dementia research taking place within the network centre, which includes the University of Oxford, Oxford Brookes University and University of Reading. The event was open to the public and featured several short talks from scientists on a range of topics in dementia. There was also a 'Dementia Question Time' with a panel of clinicians and scientists. The event was a great success with a variety of exciting talks from researchers throughout the region on diverse topics. In addition, we had an extended break, where attendees were given the opportunity to chat to a variety of people from different organisations, including Alzheimer's Research UK, Alzheimer's Research UK Oxford Drug Discovery Institute, Young Dementia UK, Age UK, New Dementia Care, Creative Dementia and the Museum of Oxford's Memory Lane Reminiscence Group. Last year's Dementia Awareness Day was held at the John Radcliffe Hospital in Oxford on the morning of Saturday March 28th. There were a variety of exciting talks from researchers throughout the region on diverse topics. The public afternoon was held on Saturday, 22nd March 2014 from 10.00am to 1.00pm at the Lecture Theatre 2, Academic Centre, John Radcliffe Hospital. Sally Magnusson, writer and broadcaster, spoke about her mother who had dementia. She recently wrote about her personal experiences in a book, “Where Memories Go: Why Dementia Changes Everything”. The talks by Dr Chris Butler, Dr Steven Chance, Prof Helen Dawes and Dr Jill Betts, Dr Rupert McShane and Dr Richard Wade-Martins covered topics about frontotemporal dementia, the relationship between brain structure, understanding physical rehabiliation in brain recovery, stem cell research and the latest research in the Thames Valley region. Alzheimer's Research UK, Alzheimer's Society, Carers Oxfordshire, NIHR Oxford BRC, OxDARE also participated at the event with information stands. 2013: "Do you want to know more about dementia?" The event, held on Saturday, 16th March 2013 at the Academic Centre, John Radcliffe Hospital, was very well-attended. The talks by Dr Olaf Ansorge (NDCN), Ms Alison Cranage (ARUK), Dr Clare Mackay (Psychiatry), Dr Susannah Murphy (Psychiatry/Cognitive Health in Ageing), Dr Laura Parkkinen (NDCN), Dr Sarah Pendlebury (NIHR Oxford BRC) and Dr Claire Sexton (Psychiatry/Cognitive Health in Ageing) covered topics including the understanding of disease progression, the relationship between vascular and neurodegenerative diseases and the effects on cognitive ability and the impact of physical and mental activity on preventing cognitive decline. Interviews with Professor Richard Wade-Martins (Oxford Network Co-Ordinator) were broadcast live on BBC Radio Oxford, and also featured on JACKfm and Glide FM Oxfordshire. Various organisations participated and set up information stands at the event including: ARUK, AgeUK Oxfordshire, Alzheimer’s Society Oxfordshire, Carers UK Oxfordshire, DayBreak Oxford, DeNDRoN, Neighbourhood Return, Oxford Dementia and Ageing Research, Cognitive Health in Ageing, YoungDementia UK. 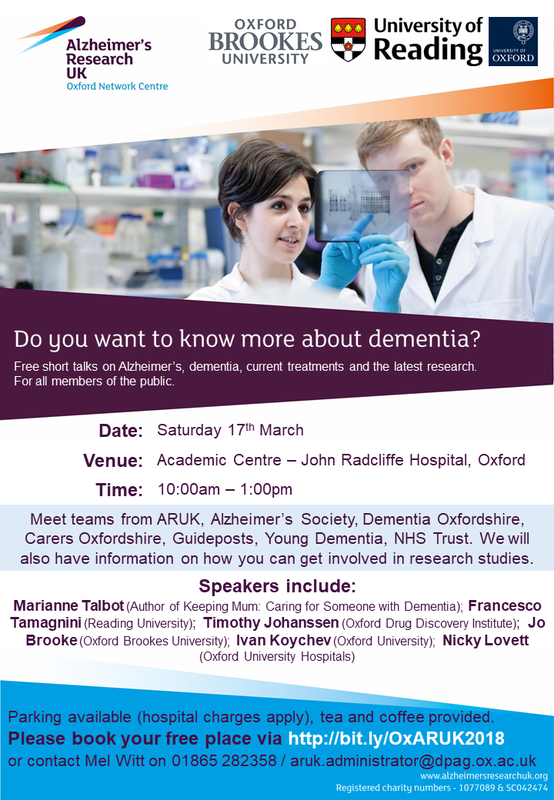 Held on Saturday, 17th March 2012 at the Academic Centre, John Radcliffe Hospital, the talks covered topics including the context of current dementia research, genetic susceptibility to neurodegenerative disease, and the use of MRI brain scans to understand dementia. 2011: "do you want to know more about alzheimer's disease research?" Held on Saturday, 19th March 2011 at the Academic Centre, John Radcliffe Hospital, the speakers spoke on brain MRI scan procedures, the neuroanatomy of dementia and experiences of research participation.